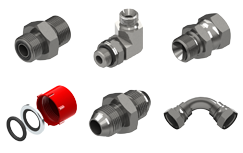 Since 1965 Burnett and Hillman has established itself as one of the largest suppliers of Hydraulic adaptors & fittings into the market place. From its beginnings in the village of Wrington, just south of Bristol International Airport, manufacturing Hydraulic Adaptors and Fittings to order. Burnett and Hillman began to introduce further ranges, styles, and to stock standard adaptors for the industry. 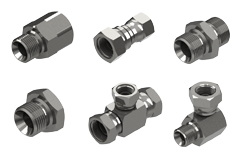 Due to the demand for the adaptors being manufactured, growth has been steady and assured. 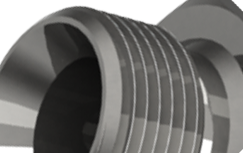 Today our extensive range of adaptors includes stock in excess of 3000 different variations of BSP, JIC, SAE, Metric, NPTF, NPSM and ORFS made from mild steel (BS EN 10277 : 1&3 – 11SMnPb30). We also manufacture special parts – a number of customers orders consist of special line parts and customised solutions – not only in our mild steel but in brass and stainless. This diversity of ranges and sizes gives Burnett & Hillman a distinct advantage over other suppliers. In keeping with the high level of quality that customers have become accustomed, Burnett and Hillman achieved BSI registration in the early 90’s and are currently ISO 9001 approved – Signalling its unwavering commitment to quality and continual improvement. Burnett and Hillman relocated into a 33,000 sq ft. Purpose built premises on the outskirts of the village in August 1998. The new factory which incorporates innovations such as an automated underground swarf removal and oil reclamation system, can produce in excess of 36,000 components per day including finished assemblies. Our machinery capacity allows us to keep up with all our customers’ demands for standard and special items. Please contact us today if you require further information. Alternatively view our catalogue products on-line. Or you can view / download our latest Product Catalogue & Price List as a PDF. WHATEVER YOU WANT, WHEN YOU NEED IT!